They had been left alone with their surroundings. A grand feast, they decided, was to be held in reverence and adoration for the ground that supported them. These folk, while small and perhaps a little naive, had many ideas and big ways to create them. Their friends had scattered with the winds, found shelters with the tides and called themselves at home. All the while, they remembered where they came from; where their understanding of appreciation began. So together they gathered, stitched their finest threads, scavenged, harvested and broiled the hardened grounds sweetest creations and gave thanks for all that has been shared and what was to come. Winter is often fierce and lonesome, yet when banded wholly and lovingly, majestic verse is exchanged in ways that makes the cold feel warm to our ever small hands that are always within reach of one another. Glögg, or mulled wine, is a staple for me in the colder months. Not an every day event, but a simple luxury after many hours of work or a day out in the snow. 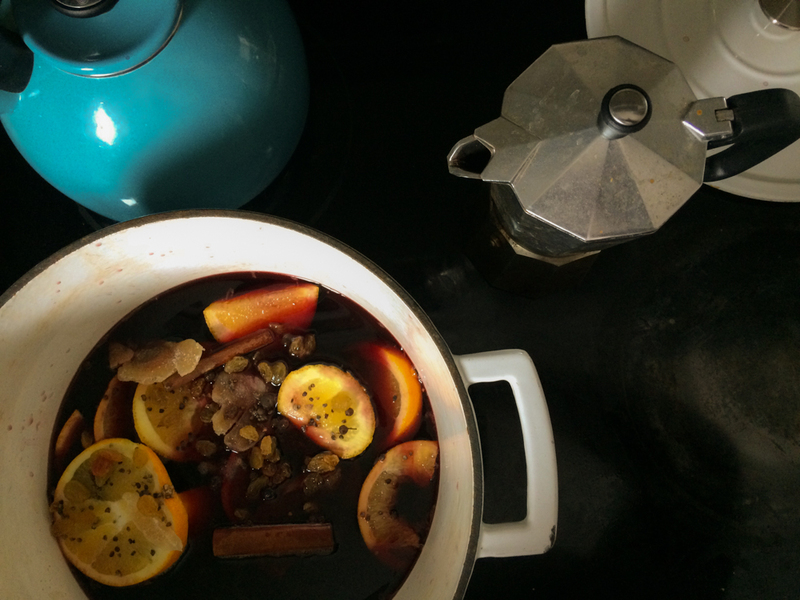 The scent of mulled wine takes me back to a winter spent in a yellow farmhouse on the outskirts of Stockholm. A place where love was abundant, the air was thick with frost and a heavy pot of glögg sat on a low slung table. It's a simple recipe, one that carries many years of tradition and cheer. Adjust to your liking by adding different fruits and spices: fresh ginger, apples, berries, allspice, anise star, peppercorn etc. Pour wine into a large pot and turn heat on low. Add fruit and remaining dry ingredients and simmer for about 20 minutes. Once the liquid is hot, add the brandy and simmer for another 10 minutes. I typically don't strain my glögg but you can with a fine mesh stainer if you'd like. Serve hot and garnish with an orange slice or cinnamon stick.